I met Stan Munro at the Reading Museum. He is an interesting guy. 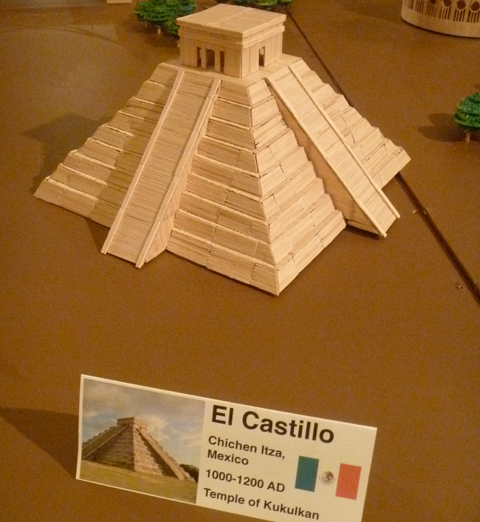 He was seated in the center of the museum’s lobby with a case of toothpicks and a container of Elmer’s glue. He was building the Eiffel Tower. Stan Munro at the Reading Museum, sketch by Kevin McCloskey. Some kids balanced books on top of their egg holders. Around the room eggs were cracking as Stan worked on. He finished his pagoda and placed it on the floor beside his desk. Stan put a book on top of his tower and it didn’t even creak. Stan piled on all his 5th grade textbooks. It still held. Then came an “aha moment.” With help from classmates Stan lowered his overturned desk onto his toothpick pagoda. It held. The crowd went wild. That was over 25 years ago. Stan still remembers that moment as the highlight of his school career. Stan did not study toothpicks in college. He went on to become a journalist. He married a doctor, the love of his life, Suzi. One day, Suzi became very ill. She became bedridden with a rare kidney and liver disorder. Suzi was put on a waiting list for organ transplants. She was able to stay in their home much of the time, but needed specialized hospital equipment in the house, including a dialysis machine. Stan gave up his jobs to stay by Suzi’s side. Sometimes he got frustrated. What could he do? Suzi had heard the story of Stan’s pagoda many times. She asked Stan to build her a toothpick tower of her favorite skyscraper, New York’s art deco masterpiece, the Chrysler Building. Stan remembers this as the most difficult thing he ever built. By trial and error Stan found the right sort of toothpicks (square with round ends) and the right sort of glue (Elmer’s). The Vatican by Stan Munro and The Raising of Lazarus by Tintoretto. Stan told me he is most proud of his version of Barcelona’s Catholic cathedral, Sagrada Família, the Sacred Family. The architect Antoni Gaudí worked on this church from 1883 until his death in 1926. The actual Sagrada Família is still under construction. It may not be completed for years. 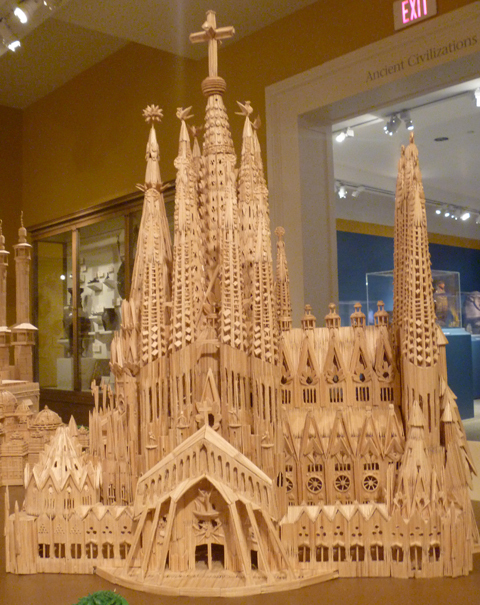 Stan based his finished toothpick cathedral on Gaudí’s original sketches, even though present-day architects have been accused of altering Gaudí’s vision. 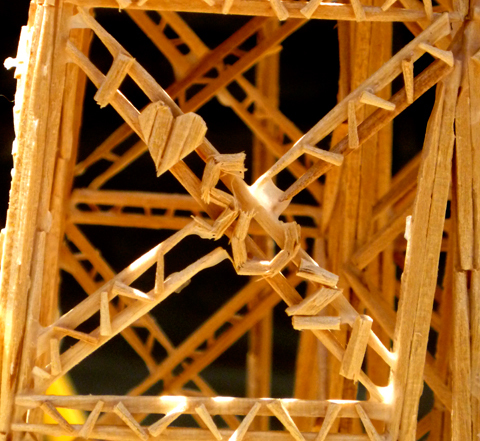 Toothpick World opened last week and will be on view at The Reading Public Museum through the end of 2012. 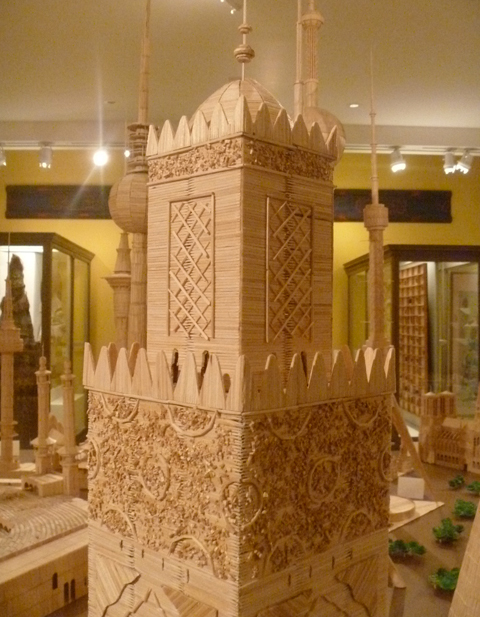 There are toothpick towers and temples throughout the museum. The Reading Museum is to be applauded for the brilliant placement of the toothpick St. Peter’s Basilica in front of Tintoretto’s Jesus raising Lazarus. It is inspiring to see the myriad houses of worship side by side. The Little White Wedding Chapel in Las Vegas stands beside Mecca’s Grand Mosque. 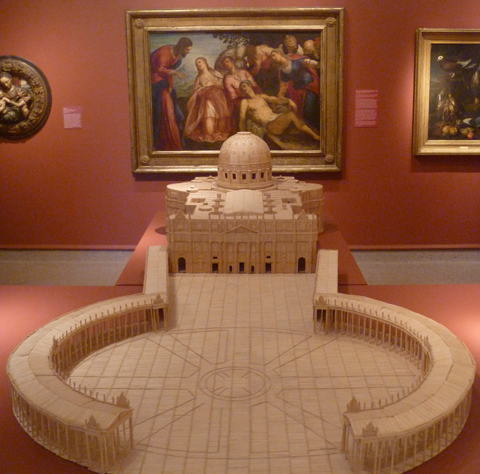 Jewish, Muslim, Protestant, Catholic, Baha’i, Maya, all coexist peacefully in Toothpick World. 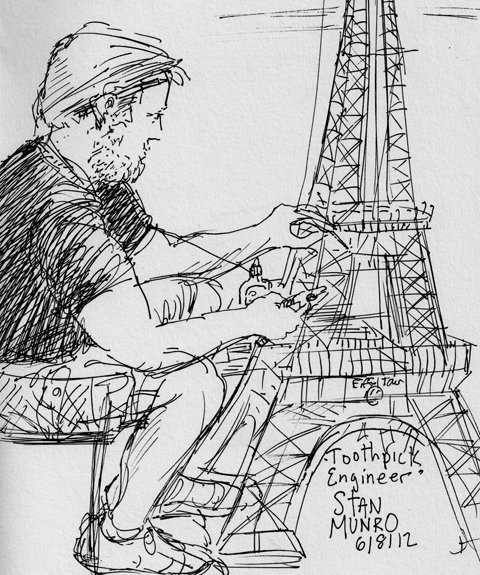 Watching Stan build the tower in the lobby I noticed how he controlled his breathing for the delicate placement of each gluey toothpick. His measured breathing is a sort of meditation. His towers, especially his temples, are visible manifestations of his meditations. Is it too much of a leap of faith to call these towers visible prayers? Stan Munro’s Sagrada Família, Barcelona, Spain, original by Gaudí. Stan is clearly a storyteller, a visionary, an educator, and a business man with a plan. Toothpick World, LLC, is a traveling exhibit corporation. I asked Stan if he thought of himself as an artist. “Artist? 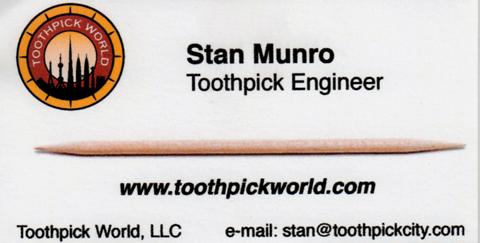 –No,” he said, “I call myself a toothpick engineer,” and he handed me his card. In my book, Stan Munro is an extraordinary artist. By the way, he can travel more now because Suzi is doing much better. She got double organ transplants at the Mayo Clinic, and her surgeons say that her recovery is nothing short of miraculous. wow! it s unbelievably awesome! thanks for sharing. Karen Fisher a friend of mary kay Wow what a wonderful of his talents to do that!! and he s very ambious to do to mediate ! Meredith Klonick-Cullen a friend of Mary kay AWESOME!!!!! Thanks for sharing…. Note: Stan Munro will be back at The Reading Museum on Aug 26-8 and Oct 30-Nov 2 to meet students and educators. His exhibition is sponsored in part by Penn State, Berks Campus. Thanks, Kevin! Sorry I missed you when you were there. Hi Mike, It is a way cool exhibit, congrats to museum staff.